This view of the dwarf planet Ceres shows the mountain and likely "ice volcano" Ahuna Mons on the right edge and the bright spots of the Occator crater in the bottom left. New research suggests that multiple ice volcanoes once dotted Ceres' surface. Whereas regular volcanoes on Earth erupt with molten rock, ice volcanoes — which are also known as cryovolcanoes — spew out plumes of water-ice and other frozen molecules. Previous research has detected traces of cryovolcanism on several bodies in the outer solar system, such as Saturn's moon Enceladus and Pluto. However, much remains unknown about cryovulcanism, especially compared with regular volcanism. 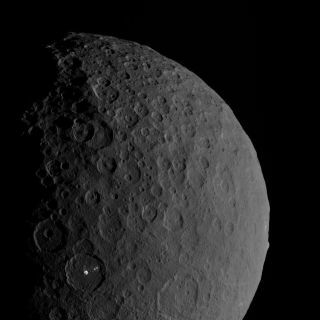 "Ceres is the only cryovolcanic body we've orbited with a spacecraft," study lead author Michael Sori, a planetary scientist at the University of Arizona at Tucson, told Space.com. "This is the best opportunity we've had so far to learn more about the similarities and differences between cryovolcanism and regular volcanism." Ahuna Mons is the only prominent cryovolcano that scientists have spotted on Ceres. This is odd: If the interior of Ceres were still warm enough to have a cryovolcano, then it should have generated cryovolcanoes in the past, when it was warmer, and evidence of those cryovolcanoes should dot the dwarf planet's surface today. All in all, the researchers estimated the amount of icy material that has erupted onto the surface of Ceres is 100 to 100,000 times less than the amount of molten rock that has erupted on Earth, the moon, Venus or Mars. Whereas cryovolcanoes on Ceres generate an average of more than 13,000 cubic yards (9,940 cubic meters) of material each year — enough to fill a movie theater or four Olympic-size swimming pools — volcanoes on Earth generate an average of more than 1 billion cubic yards (765 million cubic m) of rock a year, according to the statement. As such, while cryovolcanism helped shape Ceres, "it's nowhere near as dominant a process on Ceres as rocky volcanism has been on the geology of Earth, the moon, Mars and Venus," Sori said. "The dark spots you see on the moon at night are huge volcanic plains, and we don't see anything analogous like that on Ceres." Future research can investigate other icy bodies to see if cryovolcanism plays a similar role on those worlds, Sori said. "I'm most looking forward to the 2020s, when we'll be launching missions to Europa, an icy moon of Jupiter," Sori said.